Next month will see the 2018 Amazon Growing Business Awards celebrate the best of business. But before that, we shine a light on those vying for the title of Large Company of the Year. The Amazon Growing Business Awards are back. Here’s everything you need to know about 2018’s finalists for one of the most competitive categories: Larger Business of the Year. On 28 November, the finalists for the 2018 Amazon Growing Business Awards will congregate at The Brewery in London, hoping to win one of 18 accolades. Ahead of the big reveal, here’s what you need to know about the businesses that made the shortlist. Recognising innovative medium-sized businesses and their continued growth. adm Group is a global marketing services business. Growth story: adm has grown to become an interconnected business consisting of over 400 people across 27 offices in 19 countries. Its key objective for 2018 is to integrate adm’s software platforms to improve resilience, performance and user experience. To achieve this goal, the company formed a new business transformation team. AFI provides high-quality powered-access machine hire and sales, as well as industry-accredited training and health and safety courses. Growth story: From three UK depots and 270 machines in 2002, AFI expanded to 30 UK locations and five in the Middle-East. It now has a fleet of over 7,300 machines and provides training for 25,000+ people annually. Apex Hotels is a four-star, independent, family-owned hotel. Growth story: Apex Hotels is headquartered in Edinburgh and operating 10 hotels in London, Edinburgh, Glasgow, Dundee and Bath. Currently in the ‘Best Companies’ Top 50 Employers to Work for in Scotland and London, it employs 1,050 employees across a fast-paced labour-intensive industry and has demonstrated sustainable growth as a business, opening a new property on average every two years. Growth story: The Ceuta Group has scaled from a startup in 1994 to 380+ employees based across 10 offices in the UK, Ireland, New York, Rotterdam and Bangkok. It now trades in over 100 international markets, staying lean and agile by forming commercial partnerships. 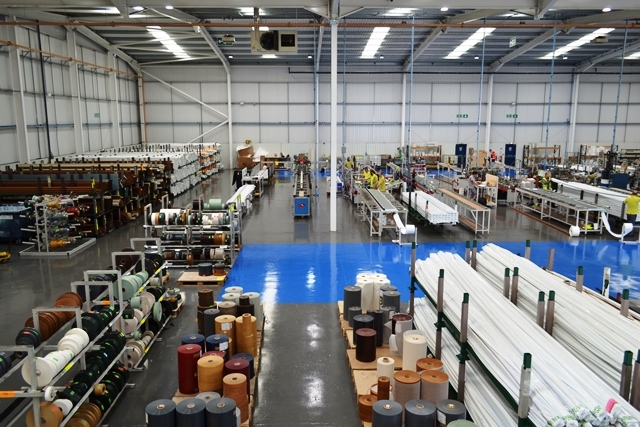 HL Plastics designs and manufactures high-quality PVCu products. Growth story: In the 10 years since Liniar windows launched into the fenestration sector, HLP has achieved 12% of the sector’s UK market share, continuing to attract new customers through brand reputation. HL Plastics’ results have grown consistently over the last 10 years; turnover rising from £12 million in 2009 to £8 million forecast in 2018. Travel Counsellors is a people-focused, caring travel company. Unmatched sea views, picture-perfect sunsets and classic Grecian architecture: Santorini is magical. Growth story: Travel Counsellors’ business model, launched in the UK in 1994, was the first of its kind to offer travel professionals the opportunity to run their travel franchise from home. It has since continued to enjoy ongoing financial success. Global sales this year are on track to be in excess of £600 million, and profits have risen 34% over the last decade. Utilita is an independent energy supplier, the first challenger to the Big Six and the first in the UK to install a smart meter. Growth story: Since 2003, Utilita has strived to bring innovation to the energy marketplace, get a fair deal for customers and help vulnerable households use energy more efficiently. In 2016/2017, it generated £389 million in revenues and a 53% increase year-on-year. Today, the business employs nearly 2,000 staff across 11 locations. Acturis is about transforming a staid, conservative, zero growth industry through its innovative cloud-based SaaS platform and associated ecosystem; enabling different participants such as brokers and underwriters to operate efficiently, embrace automation and electronic trading, improve agility and connect to other parties in the value chain. Unlike many fintech businesses, we are highly cash generative and profitable. Furthermore, the business is a genuine “ecosystem business” providing benefits for parties as we scale. Few UK companies possess these fundamentals which take vision, commitment and time to achieve – few also have managed to replicate this at scale in other geographies. Our brands are the backbone of our business. We work hard to find out what our customers want – and we deliver. We spend time investing in our brands’ development as well as the quality and design of our products. Operating across the globe, we source, ship and deliver over two million orders a year to customers in the UK, Europe and America. With a multitude of teams and skillsets, we strive for a workspace that fosters collaboration and inspires creativity. We’re always moving onwards and upwards – and that flexibility and adaptability is a key part of who we are. HH Global is an independent company delivering outsourced print, secondary packaging and creative services. We have developed from a two man print broker in 1991 to a £267m enterprise, working with some of the largest, exciting and most progressive global brands including HP, Bayer and HSBC. HH Global has curated a business model centred on an innovative approach to assessment-led outsourcing, reducing cost while improving quality for our clients. We have expanded to six continents and now deliver an array of services, most recently expanding into packaging. thebigword passionately believe that language is the final barrier to peace and prosperity. Founded from humble beginnings in 1980, thebigword has grown to be one of the top 20 language service providers globally. Our most distinguishing characteristic is our state of the art language technology designed and created by our in-house experts. thebigword Translation Management System enables clients to effectively manage the entire translation process and our Interpreting Management System provides clients with the opportunity to manage face-to-face, video remote and telephone interpreting bookings around the clock. Turtle Bay emerged in 2010 as the first Caribbean concept to hit the UK high street. Since then, Turtle Bay has opened 39 restaurants across the UK, as well as opening two sites to date in Germany. Turtle Bay is a full service restaurant and cocktail bar, enabling guests to have their very own Caribbean inspired experience. Guests can choose to dine, socialise with friends, have some drinks or have a lunch meeting. With a delicious menu, approachable team and innovative interior feel, Turtle Bay encourages its guests to relax and escape what is an increasingly busy world. Utilita is the UK’s fastest-growing independent energy supplier and has been at the forefront of the smart meter rollout since its formation in 2003. It was the first supplier to challenge the “Big Six” in the domestic energy market and now has more than 500,000 customers. Utilita strives to offer a fairer deal to lower income and energy-conscious households and aims to always be cheaper than the “Big Six”. XLN is a company that has consistently found gaps in the telecoms market – and been rewarded for it, with staggering growth over the last few years. Best part is, we’ve mainly managed to do it in ways that benefit our core customers: small businesses. Whether it’s by radically improving our customer service in an industry renowned for weakness in that area, or by fleshing out our service package to meet customer needs – both moves backed up, by the way, by our own research – our basic belief is that what’s good for XLN is good for small businesses too. The Amazon Growing Business Awards is headlined by Amazon and sponsored by Santander, Bridges Fund Management and ECI Partners. It is supported by CBI, the Department of International Trade and Real Business. This year, the awards partnered with Beanstalk, a charity that recruits, trains and supports volunteers to provide consistent, one-to-one literacy support to children aged 3 to 13. Interested in attending the Amazon Growing Business Awards? Get your ticket or book a table here.